Tired of over crowded gyms? Not sure what to do once you get there? 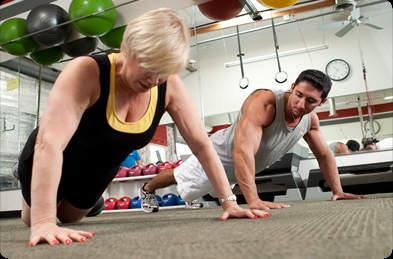 Our one-on-one personal training program is just for you! Your personalized fitness program will be developed by a certified trainer who will push you to your maximum potential, and work with you to achieve lasting results! Call the studio to schedule your first 1-hour workout today! The first session includes goal setting, benchmarking your current fitness level, and a workout to experience our unique training style. Do you want all the benefits of having a personal trainer without the cost of one-on-one training sessions? If so, a small group personal training program is just the solution you’ve been looking for. A team of personal trainers will work with you to ensure proper form and technique and help lead you to better results than you would experience on your own. The camaraderie and encouragement from a small group provides you with the support and structure necessary to stay consistent with your fitness program.